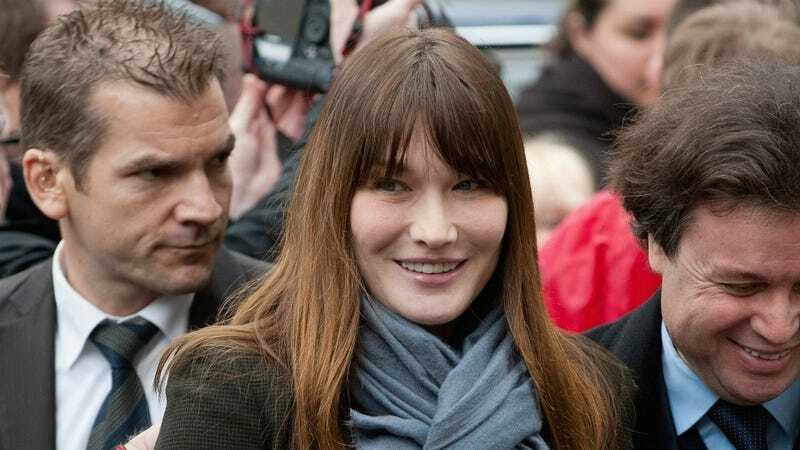 In a cover story for the January issue of Vogue Paris, out today, former French First Lady Carla Bruni-Sarkozy shared her opinion that feminism is no longer relevant. She should hang out with Katy Perry! And the maelstrom of other famous female millionaires—cough, Marissa Mayer—whose immediate disclaimers that they "aren't feminists" betrays a potential basic lack of understanding of what a feminist is. But I digress. "We don't need to be feminists in my generation. There are pioneers who paved the way. I am not at all a feminist activist. I'm not at all an active feminist. On the contrary, I'm a bourgeois. I love family life, I love doing the same thing every day." "#ChèreCarlaBruni As long as I get asked whether I am the senator's assistant, the next generation will need feminism." Faced with the prospect of at least 2,000 angry French women, with at least a few of them bound to give her the stink-eye at a fancy restaurant, Bruni-Sarkozy clarified her statements during a phone interview with French Elle: "This phrase is very clumsy and poorly translates my thoughts. It should have read: 'I have never personally felt the need to be a feminist activist." But when asked again if she was a feminist, Bruni-Sarkozy again replied: "I imagine I am if feminism means claiming one's freedom. But I am not if it means being committed in an active way to the fight that some women are still leading today... I admire their bravery a lot, but I have chosen to commit myself elsewhere." This time, she cited her work with charities for education and AIDS treatment instead of her work being a bourgeois. Go figure.